My end goal in life will always be getting as many veggies as I can into my family, haha. I know to some this is not a huge goal, but let's be honest, this is one of those goals that just makes you such a super magical force. When you make THESE AMAZING COOKIES for your family and tell them I'm glad you like because it's made from beans, or this SAUSAGE is made from oats, or this Creamy Baked Pasta is made from CAULIFLOWER, and your 10 year old son looks up at you with huge eyes like you've just solved the Pythagorean Theorem, that my friends is a goal I will forever be reaching for and hope to continue to meet each time I make a dish with hidden veggies! Ok, If you can't tell this was a hit and I'm not sure why I'm surprised because Cauliflower is an amazing versatile ingredient. I've made this a couple different times with a different flare like Mexican (added chili powder and cumin for a taco Mac flavor) and Cajun (I used Tony's cajun seasoning and it was sooo good and a little spicy). I make sure to have a few bags in the freezer for quick and healthy dishes when I just don't have time to think about it. My oldest daughter asked if I could make a "creamy" pasta. I thought about using a cashew base (too high in fat me to down a huge plate full) or a fat free vegan béchamel (which doesn't offer any nutrients), neither of these really had everything I wanted in a creamy sauce. So I scan the kitchen and decide to change up my Southern Gravy recipe to make it more pasta friendly. This is what I ended up with and the whole family loved it. Let get to it. Bring a pot of water to a boil and get 1 lb. of pasta pasta of choice started. I used 1 lb. of this Brown Rice Pasta. Boil until the cauliflower is tender enough to mash easily. Drain the pot but keep about a cup of the cooking liquid incase you need a little to help blend it. You can watch the video below to see how I pulled it together. Now's the time to add whatever flavors your going for. This is great as is but really tasty with additional spices like Chili Mac flavors or Tony's cajun to spice it up! Blend until smooth and creamy. Add this to your cooked and drained pasta. Mix well, taste and adjust seasoning again if needed. 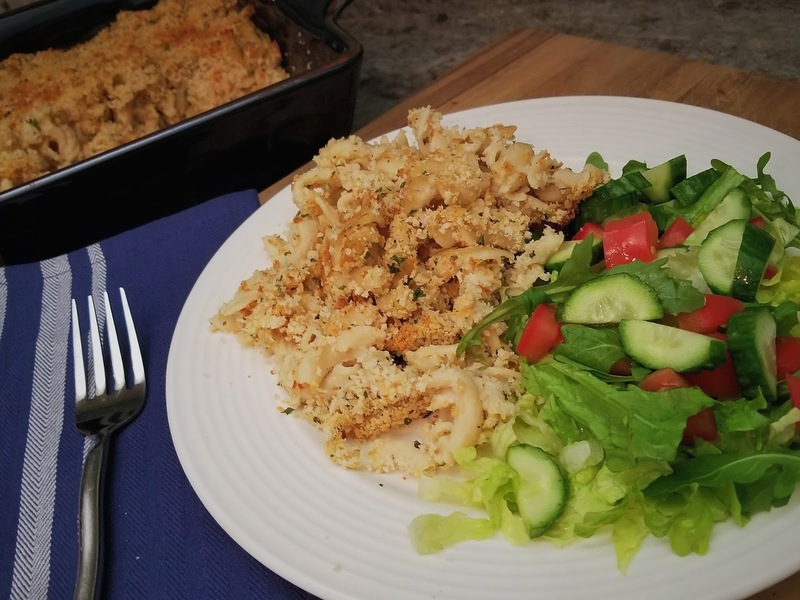 Pour Creamy Pasta into a baking dish and top with Seasoned Bread Crumbs recipe below. Pop into a 375 degree oven until the top is golden brown about 15 mins. I hope you make this and enjoy it as much as we do. Don't forget to make this into your own dish and season it up how you and your family enjoy! Then snap a picture and tag me on Instagram tell me what you did different so I can try it too!! MUCH LOVE ~ Des! 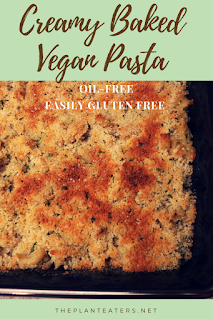 *VEGAN GLUTEN FREE BREAD CRUMBS: Potato bread crumbs I had no idea potato bread crumbs were an actual thing I'm DEFINITELY trying these) or I haven't tries these either these are on my list too, Chickpea bread crumbs. Let me know your favorite Gluten free bread crumbs so I can try them!!!??? WOW!!!! Nice bake! Pretty top notch! Thanks Jennifer!! I hope you get a chance to make it! Just want to let you know that there's no mention of lemon in the ingredients. But I'm making this ASAP! THANK YOU Kieran!! You're a doll! I fixed it!